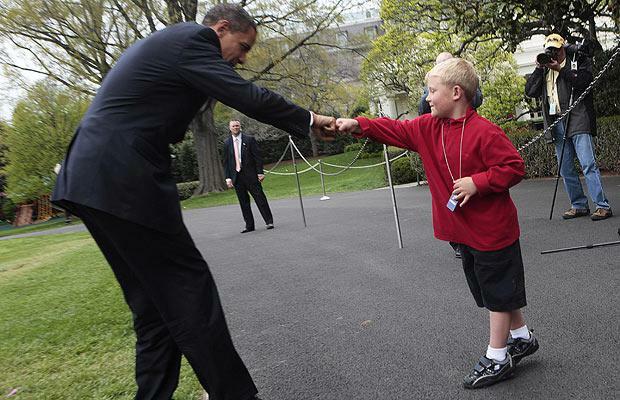 You’ll notice there are a bunch of photos of Obama doing fist bumps with kids. Since Fox is attacking the Muppets for brainwashing children, can you imagine what the network thinks of these photos? So the hosts at Fox, who likely make hundreds of thousands of dollars a year, go into a seven minute tantrum because a kids’ movie says there are greedy people in the world. And in about a minute, two sophisticated hand puppets concisely reveal how idiotic a news channel can be. I can’t watch Fox News. It causes brain damage. Let’s say, for argument’s sake, that the 2012 election turns out to be a disaster for the GOP. What would that mean for 2016? Former President George Bush has endorsed Mr. Romney. Former President George W. Bush has told friends he is following the race but has no plans to become involved. All three Bushes were at the Alfalfa Club dinner in Washington on Saturday night, when Mr. Obama joked that many people hoped Jeb Bush would run for president. “I am not one of them,” Mr. Obama declared at the private dinner, one attendee said. The Republican presidential campaign in Florida, which has erupted into a confrontation between the party’s establishment supporting Mr. Romney and conservative grass-roots activists backing Mr. Gingrich, is also infused with a subtext about Mr. Bush. At campaign rallies last week, when asked whom they planned to support, several voters said that they wished Mr. Bush were a candidate. The Republican establishment has lost control of the party. If it was pulling the strings, Romney would be the undisputed front-runner and the serial adulterer would be back at Fox News, making his guaranteed absurd statements. 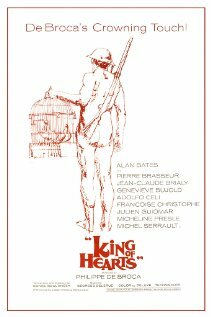 But the party has turned into the cast of the 1966 film “Le Roi de Coeur,” and Mitt Romney has taken the role of the sane “soldat” in the asylum, Charles Plumpick (I left it in French because that’s the Mittster’s second language.) If the party is totally wiped out in November — which a lot of the GOP establishment expects judging from last week’s editorial feature in the Wall Street Journal — they’ll go through an ideological purge much like the Democrats did in 1972 when McGovern was destroyed by Nixon and 1980 when Reagan eviscerated Carter. Then they go back to the basics. And the basics weren’t named Reagan. They were named Bush. When I do random scrolls through YouTube, I find things I’ve been mistaken about for … let’s see … I was born in the ’50s … this came out in the mid-’60s … it’s 2012 … carry the 1 … yeah, pretty much all my life. Oh, and it’s a great song! But how was I to know it wasn’t an all-guy group?? It was the ’60s. We had to go through a British invasion and a Motown beat and Jersey Boys and the San Francisco sound and Dylan going electric and, tell me again, who was the Walrus? And they kept saying things like “You can’t tell the boys from the girls.” Plus, we didn’t have MTV! We didn’t know what anybody looked like. Stick a photo of most of the bands of the ’60s in front of me, and I couldn’t tell you who they were. But play three seconds of a song and I can tell you what it is and who sang it. But I loved this song. I feel like an idiot. The forces of Newt are on the attack. A former California congressman named Randy “Duke” Cunningham is in a federal prison in Arizona for his involvement in a 2005 federal bribery scandal in which he pled guilty to conspiracy and tax evasion. he had a very conservative voting record. He was often compared by liberal interest groups to former congressman Bob Dornan, with some justification; both are ardent conservatives, both are former military pilots, and both have become infamous for outbursts against perceived enemies. In 1992, Cunningham, along with Dornan and fellow San Diego Republican Duncan Hunter, challenged the patriotism of then-Democratic presidential candidate Bill Clinton before a near-empty House chamber, but still viewed by C-Span viewers. In September 1996 Cunningham criticized President Clinton for appointing judges who were “soft on crime”. “We must get tough on drug dealers,” he said, adding that “those who peddle destruction on our children must pay dearly.” He favored stiff drug penalties and voted for the death penalty for major drug dealers. A typical corrupt hypocrite who should be forgotten while he spends his 100 months in jail out of public view. In the message, Cunningham says he wants to help Gingrich with prison and justice reform if Gingrich becomes president, something Cunningham has advocated in letters to the media over the past year. I heard about this last night on the Professional Left Podcast, in which an excellent point was made. This is going to be a fascinating presidential election, because there’s no way anyone can claim to be undecided about making a choice between the two parties. My sister’s birthday is today.